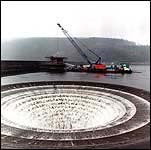 Spillways are structures that either form part of a dam, or are found just beside one. 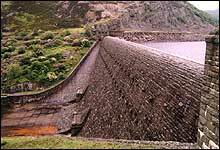 They are used, when a reservoir is full, to pass floodwater safely, and in a controlled way, over a dam, around it or through it. 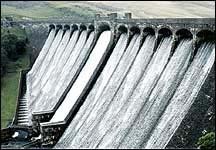 An overflow spillway is most often constructed as part of a gravity dam or a buttress dam. The spillway section is lower than the other sections of the dam allowing water to flow over its top and down its front face. 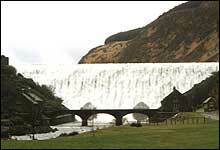 Sometimes, the whole of the dam acts as an overflow spillway. A close up of the spillway when it is dry shows that the top and downstream face are curved to control the flow of water over it. 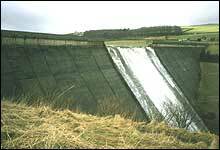 Side channel spillways are used mainly with embankment dams. They are located just upstream and to the side of the dam. The water flows over the spillway, into a side channel. Then it flows down a chute and joins the river downstream of the dam. Sometimes, a tunnel is used which may divert the water elsewhere. A shaft spillway is sometimes called a "morning glory" spillway. It is a hollow tower or shaft, usually circular, which has a funnel at its top. 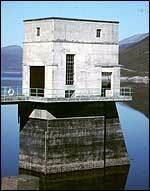 The tower sits in the reservoir near the dam. When the reservoir level rises above the top of the spillway, the water flows over its sides and down into the shaft. 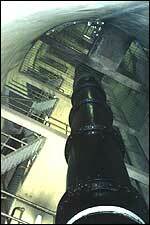 At the bottom of the shaft, it enters a tunnel. 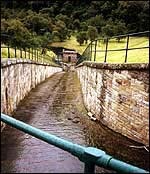 The tunnel usually runs under the dam, and diverts the water to join the river downstream. outlet tower is the one on the left. Outlet towers are found in reservoirs, usually near to the dam. 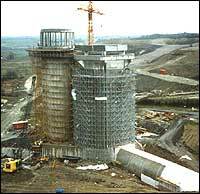 The tower sits above an outlet pipe or tunnel used to transport water out of the reservoir. It is built to house controls for opening and closing valves or gates that control the flow of water through the outlet. The controls are normally located inside in a room at the top of the tower. In a reservoir for water supply, a tower will often have a vertical pipe inside with a number of horizontal pipes leading into it from the reservoir. The horizontal pipes are used to draw-off water from different levels in the reservoir. Water is let into them by opening valves at their entrances. 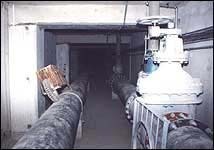 The vertical pipe then connects to a horizontal pipe that takes the water away from the tower through a tunnel to the water treatment works. 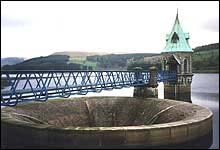 Where a tower is used to control water supply to a hydroelectric power station, there is only one inlet for the water. These towers are called intake towers. When a dam is constructed across a river valley, an outlet pipe, usually in a tunnel, must be provided from the reservoir to allow some water to continue to flow in the river downstream. Sufficient water must be let through to maintain the fish and wildlife that use the river, and the natural vegetation in and around it. This water is called compensation water. The scour is an outlet pipe or tunnel that runs through the bottom of the dam. It is usually large because of its uses. The scour can be used in an emergency, for example, when a dam is damaged and poses a threat of imminent collapse. It can be opened to let water out of the reservoir very quickly. 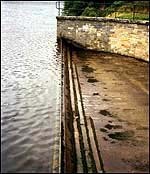 The scour is also opened to flush sediment out of a reservoir when too much has collected behind the dam. The fast flowing water carries the sediment through the scour and downstream. Valves or gates are used to control the flow of water through the scour.